It is great because it is very funny,it's three stories in one and I like Super Dog (whose proper name is Barney) the best.The book teaches the power of God. I highly recommend it. I liked this book because I like dogs, mash and I have an egg of my own. This book was good. Overall, I'd give it 3 stars. It wasn't the best but I did enjoy it. It had 3 stories in it but my favourite was 'The Alien Egg'. My favourite character was Susie Keys and it was quite funny. I would recommend it to anyone who has just started reading and would like to read longer stories. I thought it was funny because there was a dog in the school playground and the children thought he was a Super Dog. The Head Teacher came out and the dog ran away and the Head told the children to go in and nobody could concentrate on their work and the one of the kids said 'look, he's back' so all the kids ran to the window but he was gone and the kids saw his take hanging down from the roof. I loved this book because the children are so funny 😁. I think its a great book and its funny. I like that super dog helps people in hospital because I think its something important to do and I love dogs and superheroes and together its a super dog. Thank you for reading my book review. It made me laugh. I loved Super Dog and I liked the stinky alien egg. Really funny. Picture on every page and I loved the dog. I wish I went to school there. I'm 7 and I thought this was a bit young for me but I still enjoyed it and found it quite funny. IN THIS BOOK YOU WILL FIND 3 STORIES THAT ARE ALL DIFFERENT! BE PREAPERED FOR A FLYING DOG,MYSTERY MASH AND MOULDY EGGS.... HAPPY READING EVERYONE!!!!!! 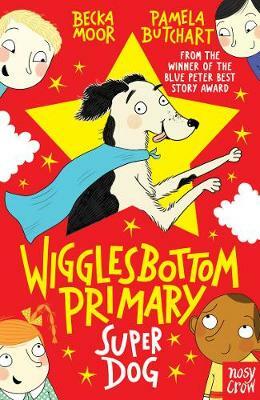 WigglesBottom Primary is a funny and fabulous tale of a super dog,some mysterious mash and an alien egg.I recommend this book to someone with a sense of humour.